A two-story H-E-B has been proposed at Meyerland Plaza, near the J.C. Penney and the BBVA Compass bank. Photo credit: Ralph Bivins, Realty News Report. HOUSTON – (Realty News Report) – Meyerland Plaza, in a move that could help to pave the way for constructing a two-story H-E-B grocery store, has been refinanced for $93 million. H-E-B Grocery Co. has been searching for a new location in southwest Houston following Hurricane Harvey, which knocked out its South Braeswood store for good. Meyerland Plaza, a 950,000-SF center located at the southwest corner of Loop 610 and Beechnut, was recently refinanced with a loan from John Hancock Life Insurance Co.
Meyerland Plaza, built in 1957 and redeveloped by Ed Wulfe about 20 years ago, has a number of big box retailers, including Bed Bath and Beyond, Marshalls, Best Buy and a J.C. Penney. Meyerland Plaza is owned by a partnership of Bellaire-based Fidelis Realty Partners, which is led by Alan Hassenflu, and New York-based BlackRock Realty Advisors. Several of the stores in Meyerland sustained water damage in the hurricane, which hit Houston in late August. Also damaged in the storm was the BBVA Compass Bank building, formerly the site of Meyerland State Bank. 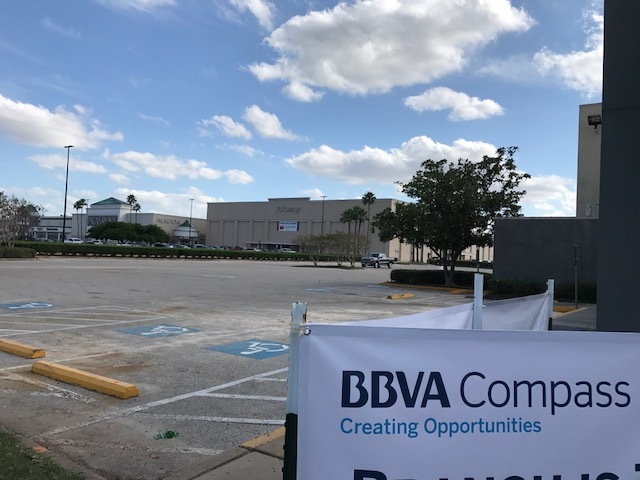 The property around the BBVA bank, which remains “temporarily” closed, could be incorporated into the new H-E-B development, Realty News Report has learned. 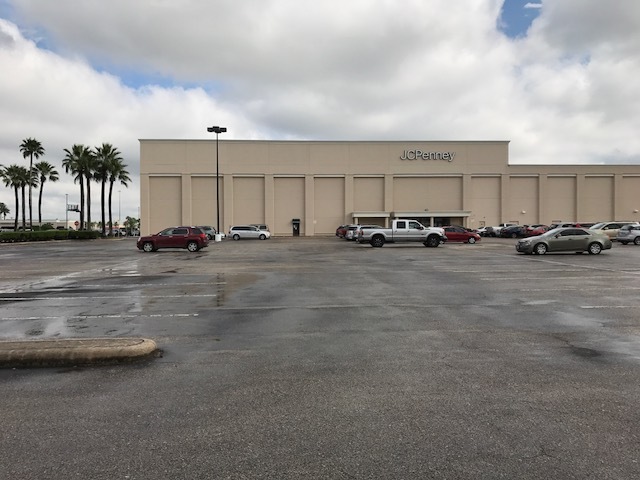 The J.C. Penney store at Meyerland Plaza, built in 1957, has significant parking. Photo credit: Ralph Bivins, Realty News Report. If the H-E-B proposal goes through as planned, the grocery store is expected to be built on the west side of Meyerland Plaza, near J.C. Penney and the BBVA Compass property along Endicott Lane. In recent years, H-E-B had been scouting southwest Houston, but it failed to actually pull the trigger to secure another site, focusing instead on acquiring Inner Loop locations. With the hurricane demolishing its South Braeswood store, combined with the planned closure of its Bellaire store while a new two-story grocery is being built there, H-E-B is left with a sizable gap in coverage. Loyal H-E-B shoppers must now travel to the chain’s Buffalo Speedway location, north of West University Place. Currently, some 197,000 people live within a three-mile radius of Meyerland Plaza and 508,000 live within five miles. Some aspects of H-E-B’s Houston expansion strategy are unexplained. H-E-B has been on a relentless quest for real estate in the Inner Loop of Houston where it already has several stores. The Houston Chronicle’s Chron.com website reported on Aug. 8 that H-E-B has contracted to buy a site at the northwest corner of West Alabama and Kirby, even though the company already has stores in the area and owns a nearby undeveloped site near the intersection of Shepherd and Richmond. The no-byline Chronicle report on the Kirby Drive site, which is across the street from a Whole Foods Market, was not verified by Realty News Report. The Meyerland refinancing was handled by JLL Capital Markets’ Tom Fish, Jimmy Board and Molly Leinsdorf.